This is a great-sounding portable drum box, representing incredible value for money. We can see it being useful for beginners, percussionists, buskers, at rehearsals, practice sessions, or for any budding drummer on a tight budget. This box is a real buzz. Amazing price. Intuitive to operate. Well-thought-out sounds, and lots of them. No reverb on any of the kick drum sounds. Disappointing default kit cymbal sound. Percussion mode does not respond to the subtleties of playing by hand. 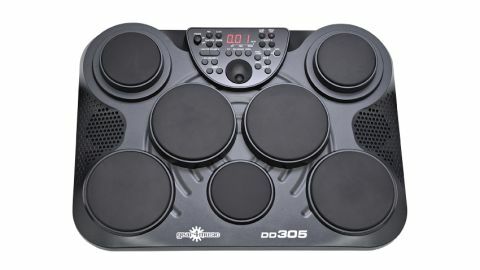 The DD305 is the latest in a line of digital drums from web-based musical instrument retailer Gear4Music. It comes supplied with power adaptor, two non-latching foot pedals, a pair of sticks, a manual and is full to the rim with drum and percussion sounds. The only additional purchase necessary is a set of batteries to give the unit full portability, and if you're going all-out, you might also like to get a USB lead to connect to a computer, but otherwise pretty much everything you need to get going on digital drums is supplied. The DD305 digital drum pad is encased in a black moulded plastic housing, measuring approximately 50cm long by 37cm wide. The rectangular-shaped unit boasts smooth flowing curves, sculpted contours and rounded corners. This not only makes the drum box more aesthetically pleasing, but also helps give it additional strength and rigidity. Altogether, there are seven velocity-sensitive raised rubberised pads. Each can be user assigned with a variety of sounds and grouped into five user kits. Sited atop-centre is an array of well-positioned, clearly labelled push-button controls and sliding switches. As there is little in the way of dual functioning buttons, the DD305 is extremely intuitive to use. The only exception to the single function control is the large rotating value wheel, which provides a quick and convenient method of changing kits, sounds and patch or pad values. To either side of the box are grilles for the integral speakers, which should facilitate good stereo separation. Power is supplied by the 12V DC adaptor or six C-type batteries (not supplied). The option to go under battery power is certain to appeal to buskers, or anyone not wishing to rely on mains power, for that matter. Within seconds of whisking the DD305 out of its box, the mains adaptor and pedals are plugged in and we are ready to roll. Rather than a tempting poke of the demo button, the sticks are in hand and we begin striking around each of the seven pads and pressing on the foot switches. First up it's the default kit, number 001 (Pop1). Initially the cymbal sound is a little disappointing as the ride is a short, fluttery, near-the-bell sample. On most electronic kits, the sound produced by using this stick technique is more like machine gun fire. On the DD305, however, the sound, that played as single strokes came across as odd, acts as a sort of filler. This gives us a convincing, seamless roll. This demonstrates Gear4Music's intelligent use of the available samples and velocity sensing. Other sounds on the DD305 prove to be as impressive as they are expressive. There are some rather tasty acoustic toms, a selection of percussion and some fine fat snares, all available with or without reverb. There is a slight anomaly with the reverb routing, however. The kick on each of the kits is bone dry - not a drop of reverb. There is also a slight noise - a bit like sand landing on a hard surface - when the reverb is on, although this is more noticeable when using headphones. One of the notable features on the DD305 is the Record option, which is useful if you want to hear how you sound to others. This function is accessed with a single jab of the Rec button. It doesn't begin recording, however, until you press the Start/Stop button (located just under the Rec button) or tap one of the pads. When it does start, a voice counts the beats of the bar. A single press of a button also takes you into Percussion mode, which takes you instantly to the DD305's percussion voices and kits. It would be nice if this mode optimised the pads' response for being hit by hand, but this is a small niggle on an otherwise excellent drum pad.